The barnacle goose population wintering in western Europe has increased markedly during the past decades. They also stay much longer on the wintering grounds in spring. 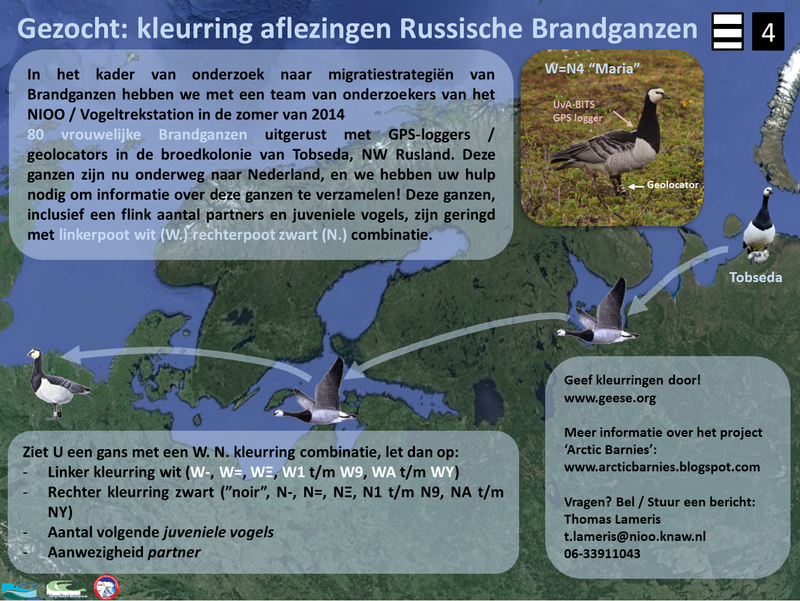 Barnacle geese breeding in Arctic Russia may stay in the Netherlands and Germany up to mid May, before flying almost non-stop to their norther breeding grounds. Howver, there are also individuals that leave much earlier, and use stopoer sites in the baltic area before oving on to Russia. It is not known what the consequences of these different migration strategies are, and whether diffferent strategies lead to different arrival times of the birds in the Arctic, with possible effects on their subsequwent breeding success. To study this, a team of researchers of Vogeltrekstation and the Animal Ecology department, both of the Netherlands Institute for Ecology (NIOO-KNAW) visits the breeding colonies of barnackle geese around the abandoned village of Tobseda in Northwestern Russia. In 2014, in total 80 female barnacle geese were fitted with GPS-loggers (UvA-BiTS) and geolocators track their spring and autumn migration routes. We also study ther breeding succes , from the initial nesting phase to the feldging of their young and arrival on the wintering grounds. This enables us to link migration strategy to breeding success. The geese carrying loggers or gealocators, as well as their partners and many of the offspring, are easily recognized by their characteristic white and black colour rings. In addition to the traked gesse and their relatives, we also marked many other barnacle geese with this new colour combination and will continue to dio so in 2015. When the geese are on their wintering grounds, we have the opportunituy to check how many of their young survived the autumn migration. Here, we need your help! All barnacel geese that are part of this study wear a white ring with black inscription on the left leg, and a black ring with white inscription on the right. The inscriptions can be “one bar” (-), “two bars” (=), “triple bars” (E), 1-9 or A-Z. Examples of combinations are: W=NJ (White two bars, Black J) or W5NE (White 5, Black triple bar. When you find a barnacle goose with these (or other) colour rings, please note1) de colour ring code, 2) the number of accompanying young (and their codes if present) and 3) the presence of a partner (and its code if present). Also check for the presence of a GPS-logger on the back or a geolocator on the white legring (see photo) and report that in the remarks field. Read a poster about how to read colour-ringed barnacle geese. More iformation about the project can be found at www.tobseda.com.